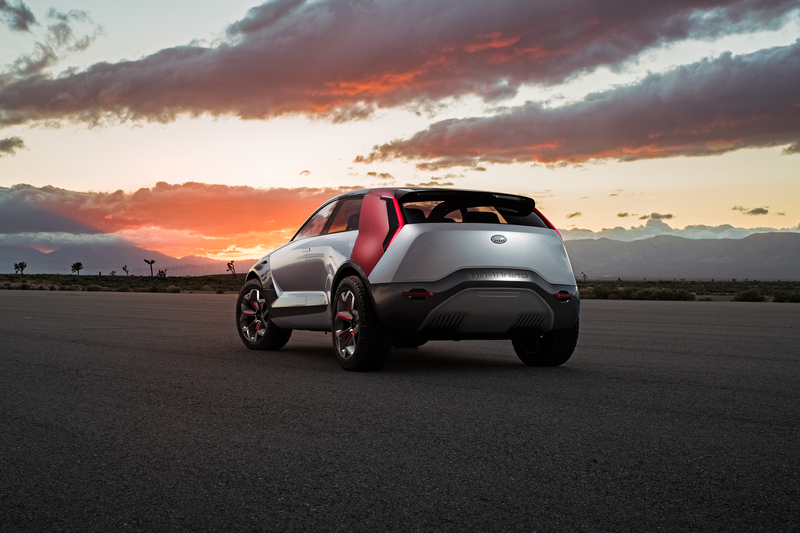 NEW YORK, April 17, 2019 /PRNewswire/ -- Today Kia Motors America (KMA) unveiled its vision of the future of electric vehicles and it's hot. And spicy. The HabaNiro concept is a fully-electric, all-wheel drive, four-seat wonder car with an All Electric Range (AER) of more than 300 miles, level-five autonomous mode, butterfly wing doors and more advanced tech than what helped land men on the moon. But this is no fanciful supercar that will likely never be built, but a prescient look into the future of mobility where automobiles will seamlessly integrate design, capability, usefulness and creativity. Kia’s spicy HabaNiro electric vehicle concept makes debut. Spicy Kia HabaNiro concept represents the brands vision for the future of electric vehicles. Bold, imaginative design and high-tech features found within Kia’s HabaNiro concept combine to present the future of automotive interaction. 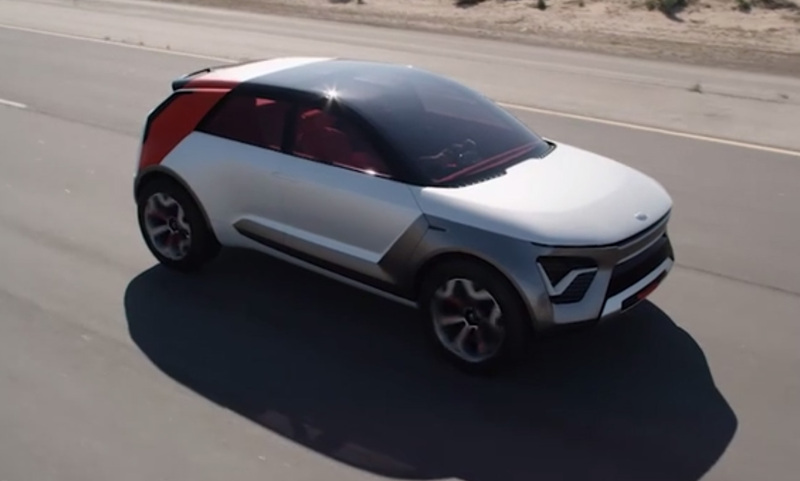 "We wanted this concept to be comfortable navigating city streets, carving turns on a coastal road and off-roading with confidence to remote wilderness adventures," said Tom Kearns, vice president of design for Kia Design Center America (KDCA). "We imagined a car for everyone and nearly everything. Then, when we saw the finished product, we were blown away by the imagination of the HabaNiro's creators and its laboratory of technology and we want it in our driveways. Today." With its rugged 20-inch wheels, short overhangs and big haunches, the HabaNiro exudes coiled muscularity and capability, whether you're on a grocery run, en route to a meeting or in search of a remote fishing hole. "We couldn't be more proud of our design center," says Michael Cole, KMA chief operating officer and executive vice president. "The HabaNiro is a genius work of skill and imagination. Not only does its beautiful design incorporate the needs of future mobility, but its engineering and technology anticipate the way people will want to move in the near future." The HabaNiro is a compact crossover utility vehicle only in terms of existing industry category language. But the HabaNiro can't be so easily defined. It's essentially an all-electric Everything Car or ECEV – commuter, crossover, sport utility, state-of-the-art technology workroom and adventure vehicle. The HabaNiro design is defined by the energetic interplay between the protective metallic grey cladding that encompasses the front wheels and extends onto the body sides and the bright "Lava Red" aero panel that defines the C-pillar and extends up and over the roof. These two elements create a vibrant energy and a forward-leaning posture that suggests the HabaNiro is ready to launch. This latent forward energy is reinforced by the single elegant character line that wraps around the front end, extends through the shoulder, and ends dynamically pointed at the rear wheels. The HabaNiro grille resembles a shark's snout, complete with a slit-like gap full of gloss black aluminum "teeth" similar to the cooling blades found on high-end electronic equipment. The EV chassis architecture allowed the wheels to be pushed to the corners, giving the HabaNiro its wide and confident stance. Satin aluminum skid plates, milled billet aluminum tow hooks, anodized Lava Red aluminum accents, and the embossed HabaNiro name complement the upscale look while suggesting the vehicle's adventure-ready attitude. Perhaps most importantly, the heartbeat pulse of the daytime running lights announces the HabaNiro's animated energy – "I'm alive." The scissor-like opening of the HabaNiro's four butterfly-wing doors hints at its future-forward interior design. 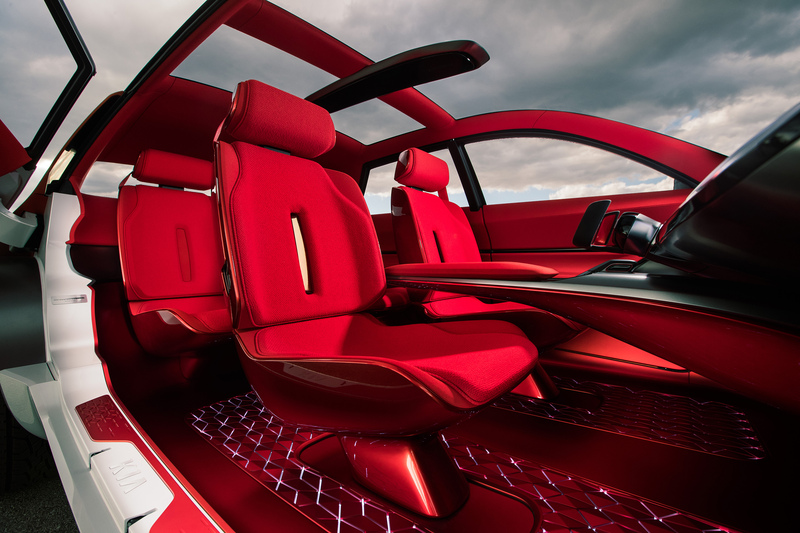 The Lava Red interior suggests passion and vibrancy. Modern and airy, the interior is accented by the bouclé fabric-trimmed front seats that appear to float within the spacious cabin. Contributing to the interior's clean and modern appearance is the absence of rectangular screens and traditional control knobs and buttons. Instead, the HabaNiro features a full-width front windshield Heads-Up Display (HUD) system controlled by a concave acrylic instrument panel that is a large interactive touchpad display with Sensory Light Feedback (SLF). Technical Option Sharing System (TOSS) allows users to swipe and move vehicle options across the HUD screen as though moving chess pieces. HabaNiro's occupants are kept comfortable by a slim Perimeter Ventilation System (PVS) that quietly and evenly blows a curtain of air throughout the cabin. A soft ambient glow shines through the bold geometrically-patterned floor, creating movement that reflects onto surfaces within the cabin. The Lighting Color Effect (LCE) can be dimmed or brightened, and the hue can be modified to impact the mood of the interior environment. When HabaNiro's part-time level-five autonomous driving system is engaged the steering wheel and instrument panel retract forward to provide more room for the front occupants. Media or other entertainment, such as a movie for a long highway haul, can be displayed on the full-width HUD video system. HabaNiro features Kia's new Real-time Emotion Adaptive Driving (R.E.A.D.) System introduced earlier this year at the Consumer Electronics Show. R.E.A.D. can optimize and personalize a vehicle cabin space by analyzing a driver's emotional state in real-time through artificial intelligence-based bio-signal recognition technology. The technology monitors the driver's emotional state and tailors the interior environment according to its assessment – potentially altering conditions relating to the human senses within the cabin and in turn creating a more pleasurable and safer driving experience. R.E.A.D. also enables the HabaNiro's Eye Tracking System (ETS) with 180° rearview video display. The system uses AI-based emotional intelligence to monitor when the driver looks up to the top of the windshield where conventional rear view mirrors are traditionally located. The AI immediately senses the driver's need to see behind the vehicle and instantly activates the 180° rearview video display. There are no immediate plans to utilize AI to sense when the driver is hungry and then direct to the nearest drive-through where an order will be waiting, but the technology may someday evolve to make just such a task possible. AI and automation shouldn't take the joy out of driving, as some auto lovers fear, but should enhance it - anticipating needs so we can concentrate on the driving experience. Some will assume the HabaNiro concept will never be built, but we don't advise betting the farm on it. 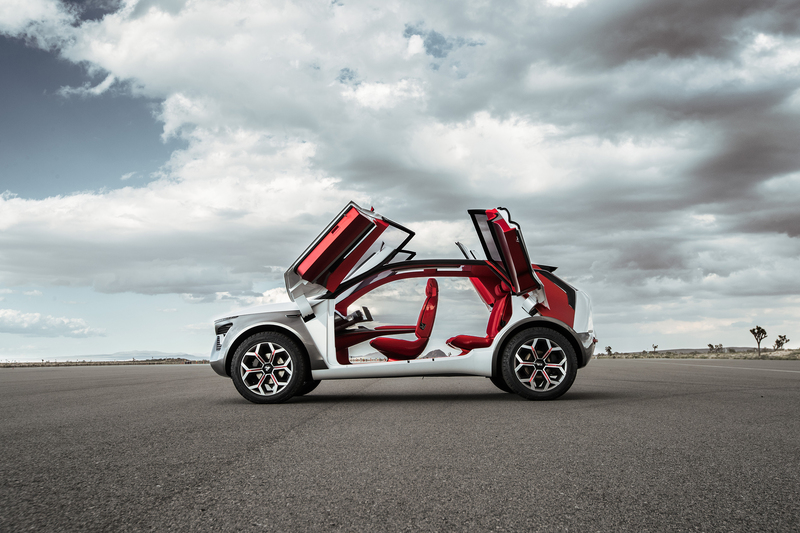 In the past 18 months, Kia has launched two vehicles, the Stinger and the Telluride, from concepts that fully captured the public's imagination. The HabaNiro's butterfly doors? Maybe not today, but the future is an exciting place and Kia is ready to lead the automotive industry into this spicy world of possibility. For media information, including photography, visit www.kiamedia.com. To receive a custom news feed, go to www.kiamedia.com/us/en/newsalert.